I often store websites I visit in the bookmarks to access their contents at a later time. Happens quite often after reading an RSS feed entry, or stumbling upon an interesting link that I have no time to follow at that moment, and that I do not want to keep open in a browser tab. The problem with this approach is that those "read later" bookmarks get mixed with the other bookmarks. It would of course be possible to create a special bookmarks folder for temporary bookmarks, but that would require some dragging and dropping, or navigating through the bookmark structure before the bookmark could be saved. TempMarks offers a solution. The Google Chrome extension places an icon in the Chrome address bar upon installation which can be used to add, access and clear temporary bookmarks. The extension in its current stage offers the controls after clicking on the extension icon. Here it is possible to add the active site to the temporary bookmark's list, clean the list or access previously saved bookmarks. It takes a total of three clicks to save a bookmark, and two clicks to load a website or clean the listing. The developer could streamline this process by saving the website automatically if the plus button is clicked on in the interface. A keyboard shortcut to save and access temporarily saved bookmarks would be handy as well. 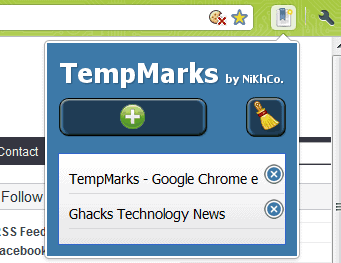 The biggest advantage of TempMarks is that it stores the temporary bookmarks in its interface, and not in the Chrome bookmarks. TempMarks (via Caschy can be downloaded directly from the Google Chrome extensions gallery. Firefox users can look at Tark Temporary Bookmarks for a similar add-on. Great little find, defo using this in future.